I had a friend draw my attention to this gifted and talented young lady. 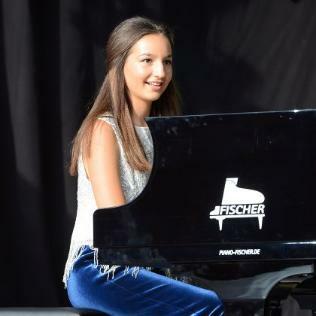 This gifted pianist was born in August 2001 and at the tender age of fourteen has accomplished more than some accomplish in a lifetime. Her grandmother is said to recognize her talent on the piano by the age of two years old. her website, Emily has been composing music from the age of three. By the age of four, Hal Leonard had published some of her work. She is considered a musical prodigy. She has been an ASCAP member since the age of five. At the age of six, she became the youngest recipient to receive the ASCAP Morton Gould Young Composer Award. She has performed at venues such as Carnegie Hall, The White House, Lincoln Center and the Hollywood Bowl to name just a few. She has appeared on The Ellen DeGeneres Show six times over the years and more talk shows are taking notice of her. She has played to sold out audiences across the U.S., Europe, Japan and Korea. She has also composed for TV, film and commercials which she states she loves to do. One of her most notable commercial spots is for Weight Watchers. She has released six CD’s of original music. Her last CD, Diversity, was produced by the legendary Quincy Jones. She is versatile in not just one genre, but several including classical and jazz. She privately studies these styles and composing with not one, but four different leading musicians in their field according to Wikipedia. In 2015, she won another ASCAP Foundation Morton Gould Young Composer Award. I encourage you to check out this talented young lady and listen to her beautiful renditions.